Teach Easy Resources: Need some Song Ideas for Your Mother's Day Performance? Check out these Songs and Crafts! We love to do performances for the parents in our class. And no matter how the show goes, parents always seem to LOVE watching the kids perform. Whether the children all sing or don't sing -- doesn't matter! Whether the children all remember their lines or some of them forget -- not a concern! Parents don't even seem to mind misbehaviour. In fact, sometimes a child doing "his own thing" is the most amusing part of the show - unless of course, it is your child who is "doing his own thing!" So, with our Mother's Day Tea Party coming up, of course we are planning for the children to perform a few songs. One pick for this year will be the song Skinnamarink. If you're not familiar with this one, just check out the words below. The tune you can easily find on You Tube. I have written some possible actions for the children beside each of the lines. Hopefully you can figure them out with no visuals! (arms out with elbows bent like a genie on "skinnamarinky"
A song that is familiar to most, but still a big hit with the moms, is "You Are My Sunshine." We usually just sing the first verse below. While performing the song, the children hold up a sun that they have made. When the song is finished, the children each take a turn coming up to the front. We ask each of them, "Why is your mom your sunshine?" Then the child flips his sun around and holds it high in the air. Written on the back of the sun is the reason that they chose. The children can either say their reason out loud, or the teacher can read it for them. If you read it for them, it is helpful to record each child's reason onto a master list so that you don't have to try to read from each child's sun. It was a couple of years ago that I performed "You are My Sunshine" on Mother's Day. But I remember the laughs, giggles, and even a few happy tears being shed when the moms listened to the reasons why they were loved by their kids. I do like to bring out people's sentimental side! 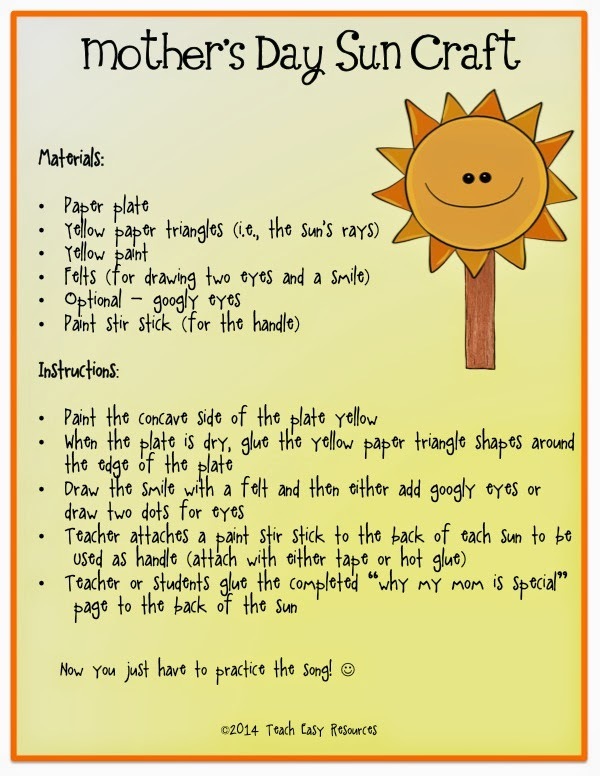 Below, I have a copy of the directions and worksheets (2 options) to make the sun craft if you'd like to try it with your class.